Although John Nippolt is a teacher of fine arts, not of mathematics, he has no trouble adding 2 plus 2 and coming up with a real-world answer. "We've got to give the writers a venue to express themselves, that's all there is to it," said Nippolt. "We did it for the skaters -- the city built skate parks. Now we need walls for the writers." "Taggers were upgraded to 'bombers' and now they're 'writers' -- 17-year-old writers with spray cans," explained Nippolt. By now you've figured out that we've moved beyond students toiling in composition books with No. 2 Berol Mirados. 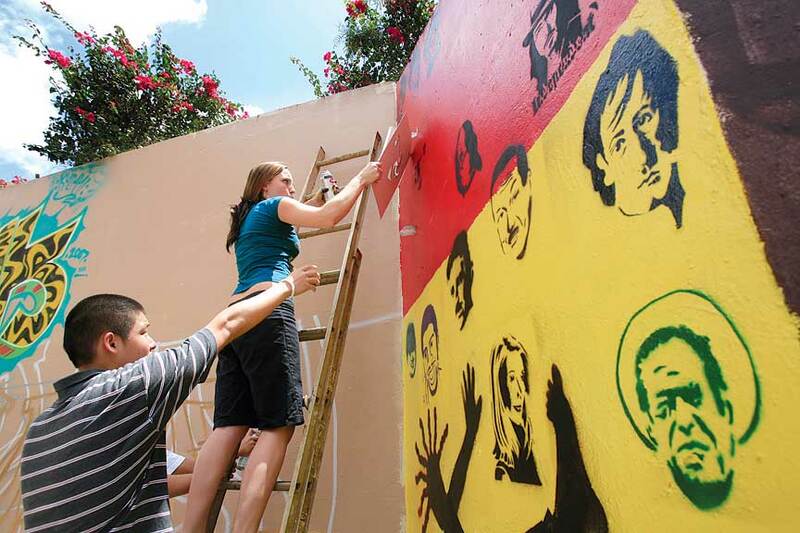 The "writing" that's crying for a big canvas is done with spray cans and stencils on walls. Generally blank walls alongside businesses and freeway overpasses. But don't mistake simple "tagging" and "autographing" graffiti with the big, colorful urban-art aesthetic. 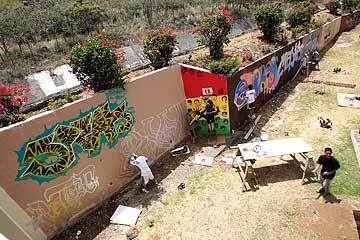 We're talking about artists with a need to create, not gangs staking out turf. It might look the same to the uneducated eye. But it's not, and that's what education is all about -- learning how to discern. 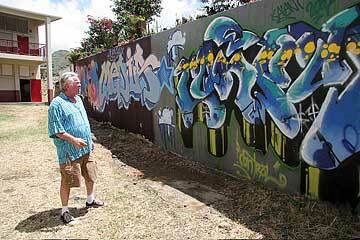 Which is why Kalani High School fine-arts teacher Nippolt and a crew of otherwise terminally shy kids were out behind the school last weekend, decorating a wall with bright colors and swirling shapes. "Kinda nifty, huh? Start by covering the wall with one color and then add to it," said Nippolt, red-faced either with excitement or heatstroke, and maybe both. "It's not freehand; each student had to make a concept sketch to be approved. The theme is that the word is image, a First Amendment kind of thing. A quantum leap for any era. Hey, it started on cave walls in the Paleolithic. The greatest thug painter of all time was Caravaggio!" Not everyone would agree that the swaggering, bad-boy brush-wielder of the Baroque is a swell role model, but his talent was undeniable -- Caravaggio essentially invented modern painting. But Caravaggio did not lack for patrons in the late Renaissance. These days, however, with arts funding in the schools being whittled away -- you don't really need that right side of your brain, kids -- budding artists with big ambitions and a trunk full of spray cans have nowhere to create. "They're screaming for a place to put their stuff that doesn't involve really heavy fines or jail," said Nippolt. "All we need are walls and not punishing, punishing, punishing these kids for wanting to create." Despite a go-ahead from the school administration and 25 gallons of paint donated by Sherwin-Williams, Nippolt had to have a sit-down with the real power on campus, the school custodian, and "his concerns were righteous," said Nippolt. "We had to promise to keep a tight leash on it. "Look, they understand color and design. They're artists. They're not defacing the property; they're making it live and vibrate. Kids will come to school and see this and go, 'Wow! Something that belongs to us!' We want kids from every public and private high school in the islands -- and their teachers -- to participate. Somebody has to be vocal and stand up for arts education. Why not teachers?" How long before the kids' faux graffiti is itself sprayed and neutered by off-campus taggers? "Not if; it's a matter of when," sighed Nippolt. "Taggers and autographers are vandals. That's all there is to it. We plan to put up motion sensors and cameras and document the vandalism when it happens. It's a crime."